Boatersland Marine > Plumbing/Ventilation > Pipe/Hose Adapters > Moeller 021003600D Drain Tube - Brass 6"
Moeller 021003600D Drain Tube - Brass 6"
Special alloy. Flanged 90 degrees one end. Functions as drain for transom, motor well, livewell or baitwell. 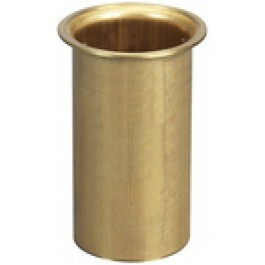 Use similar metal between tubes and plugs. Designed for use with Moeller Snap-Tite, Turn-Tite and trail 'n Bail Plugs. Wall thickness is .035". Material: Brass. Size: 1" OD x 6" L.